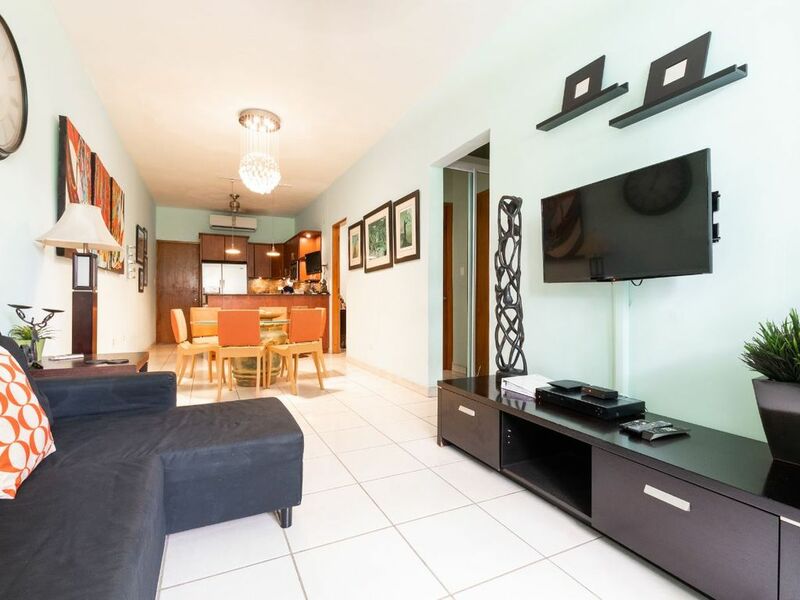 This is a comfortable upscale 2 bedroom & 2 bathroom TOWNHOUSE in the heart of San Juan, minutes away from the beach and all the city action; Hotels, casinos, restaurants & beach. In addition, the property is only 5 minutes away from the Airport and Old San Juan. The master suite has a king size bed and master on-suite bathroom with TV. Guest bedroom has a queen size bed with a full bathroom as well. There is a sofa/bed in the living room for children or couple. Plasma TV in living room, kitchen, master bedroom & master bathroom. The property also includes courtesy WiFi-internet, air conditioning throughout entire property, fully equipped kitchen & plenty of street parking available. Renting a vehicle is not necessary but its always recommended for practical purposes. Cab rides are only about $5 to everything and the bus stop to Old San Juan is walking distance. Contact me for more information about attractions during your stay. 25% discount to all FEMA and military for Hurricane Maria Relief Efforts with valid ID. This property has full POWER. I am a young professional who has been working in the short term rental industry since 2007. I am a proud owner of this townhouse and it has taken me several years to finally bring it to its current state. Its beautifully furnished and has all high end appliances. Tasteful colors with a designers touch. I also manage several other properties in San Juan & in the Wyndham Rio Mar Resort and Casino. So feel free to inquire about my other properties to find you the best property that suits you & your family. This property is one of my best rented. Perfectly located in the heart of the city and near all the action. It is located in a safe neighborhood and its ideal for both family and vacationers that wish to have a good time. The comfort level this unit provides is probably the best asset. As well as being in such close proximity to old San Juan and & Airport. I am also available 24 hours a day to all my clients. We were pleasantly surprised on how the apartment was tastefully decorated! The beds were super comfortable and having air-conditioning throughout the apartment was a plus! The property was near the beach and Jaime was super responsive to whatever questions we had and gave us great recommendations on what to do on the island. There are so many things to do in Puerto Rico! I definitely recommend renting this property from Jaime he was a great host! This has to be one of the best vacations I've ever taken.. The house was beautiful.. The location is perfect. 10 minutes from the airport, old San Juan and the beautiful Isla Verde.. The minute I arrived with my family, Jaime was on point. He made the entire transaction so easy.. Thanks again for everything. I can not wait to come back to Puerto Rico.. I stayed at Jaime’s beautiful home for 7 nights and was very pleased with this unit. It was tastefully decorated and was really comfortable. Especially the beds, omg I slept great. AC’s worked very well and the unit was very spacious for all 6 of us. We walked to the grocery store and a few restaurants nearby. Jaime recommended ABRACADABRA and it had amazing brunch. The unit was located in the center of main area of the city and we took 5 mins cabs practically everywhere. We were worried about the drought before coming to visit since we booked 6 months in advanced but surprisingly there were no water interruptions. Jaime mentioned that the water rationing was no longer in effect. Overall we had a great time and the townhouse had a lot to do with it. I would definitely come back. 5 stars even without water!!!! Yep, you read that right!!!! Santurce had a water outage while we there for our entire visit and that still didn’t ruin our trip. Jaime is a gem! He takes good care of his guests. Even though the water situation was out of his control, he offered to refund us for the remaining nights so that we could go to a hotel. But we were already feeling at home and didn’t want to relocate. So instead, he gave us a great discount and brought us water every day for ‘bathing’, drinking, etc. His house is exactly as it appears in the pictures- beautiful and extremely comfortable. Jaime made sure to anticipate our every need. Whenever we called/texted, he responded in a timely manner. He had the best recommendations such as dinner/dancing at San Juan Hotel, Brunch at Abracadabra (which also has live jazz on Friday and a must visit that’s walking distance from the house) and authentic PR food from Bebo’s. The house is located near 3 beaches, but my favorite was Ocean Park (less people). I loved being in the neighborhood feeling like a local as I walked to the grocery store, bookstore/coffee shop and caught the bus to Old San Juan. I truly hated to leave…..
Property was as described. Jaime the ower was pleasant, a great help and easily accessible. I would text him with questions and he would reply within minutes. Wish I had more time to spend in San Juan. The property also includes courtesy WiFi-internet, air conditioning throughout entire property, fully equipped kitchen & plenty of street parking. All you need to make reservation final and secure the dates is a security deposit. Contact owner for amount.